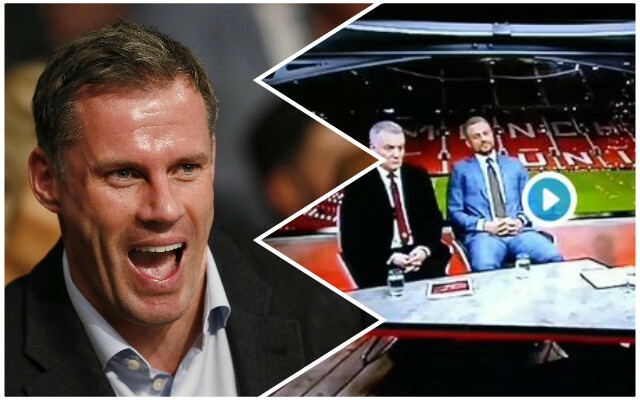 Former Reds defender Jamie Carragher made a surprise appearance on Manchester United’s TV channel as he hilariously disrupted a discussion about whether he is biased against them on Sky Sports. As former United players Lou Macari and Wes Brown spoke about him, Carragher popped up on set and admitted United “weren’t bad” against Huddersfield Town – having overheard them criticising his comments as he walked past. Carragher certainly hasn’t been biased in his Sky Sports punditry or co-commentary – it’s literally been hard to find anything good to say about them this season. He has not been the only pundit to struggle to find much positivity since the beginning of the season. With the Reds 19 points ahead of United, they have got much bigger problems than what Carragher says in his media role. Carragher might well be in the studio when the Reds go to the Etihad Stadium for the huge game against United’s rivals Manchester City on Thursday night, where a win would put the Reds 10 points clear of City in the title race – hopefully he’s laughing and smiling just as much after that game as he was here.